CDW’s reference guides provide a high-level, informative take on today’s most pressing IT solution areas and related issues. Speaking to the interests and concerns of IT managers and their staff, as well as their enterprise counterparts, the guides provide up-to-date summaries, strategic guidance and best practice tips on the technologies driving IT operations forward. 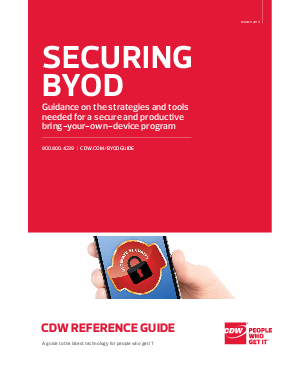 Some of the topics covered in this Securing BYOD reference guide include implementing comprehensive enterprise management plans, securing data in all contexts: network-level, traffic-level and device-level, drafting an effective BYOD policy, protecting against social network-based threats.